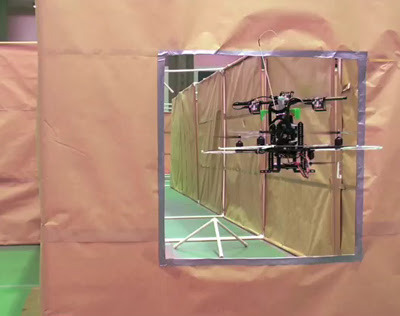 To buy a little extra time for their algorithms to execute, and to ensure maneuverability in close quarters, the MIT researchers built their own plane from scratch. Adam Bry, a graduate student in the Department of Aeronautics and Astronautics and lead author on both ICRA papers, consulted with AeroAstro professor Mark Drela about the plane’s design. “He’s a guy who can design you a complete airplane in 10 minutes,” Bry says. “He probably doesn’t remember that he did it.” The plane that resulted has unusually short and broad wings, which allow it to fly at relatively low speeds and make tight turns but still afford it the cargo capacity to carry the electronics that run the researchers’ algorithms.